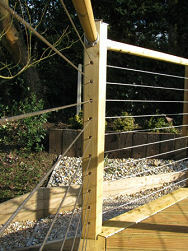 A 4mm stainless steel (marine grade) tension wire system. 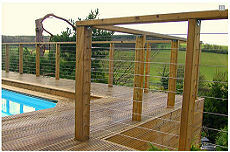 Suitable for most timber to timber applications. 3 options on wire type as shown are offered. 1x19 or 7x7 being the standard for type 1: 7x19 being the standard for type 2 and 3. These assemblies are made to measure,the terminations being hydraulically pressed onto the wire. This giving a professional and permanent connection. Type 1 is suitable for straight runs only. Type 2 and 3 can be used around corners, a diagonal through hole of 6.5mm being required through any corner post. Installation is simply a matter of drilling small pilot holes and screwing in the "dual thread screws" at the end termination posts. Through holes being drilled in any mid posts. 8mm diameter for Type 1, 6.5mm diameter for type 2 and 3. Once the wires have been run through mid posts, connections to the "dual thread screws" can be made. Connections as per upper images. Type 1: Achieved by rotation of the wire assembly and inside thread terminals. NOTE: this system uses left and right hand terminations. One at each end. Type 2 and 3: Achieved by rotation of the tension bodies. After tensioning, all lock nuts must be nipped up. 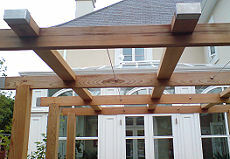 The measurements required are the inside of end post dimensions. ie: face to face, the points at which the "dual thread screws" would be inserted. Where the wire is to run through a corner post, the post must be drilled at 45 degrees. A measurement taken across the post.